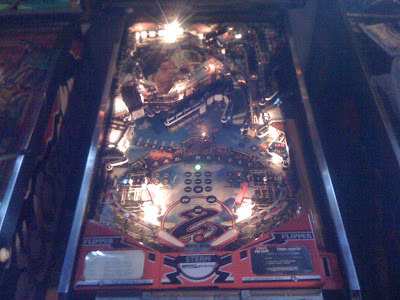 suicide bullets: Iron Maiden - Stern (Pinball) lives! Back when I picked this machine up, I knew it wasn't working and had no problem paying someone tp get it working, but as these things go, we got about halfway and couldn't figure out what was wrong. It would boot up, but would exhibit really wierd behavior, like the left slingshot firing the right, the upper right kicker actually firing the knocker etc. We changed some connectors and checked connectivity and thought all that was fine. I decided to take my backbox up to the only other person I know with an Iron Maiden - John Dayhuff - and see if it was a board issue or what as it was certainly logic getting to the game that was screwy. We swapped MPU's, solonoid driver boards all for nought. We compared wiring from both units and they were the same. John then started to go through each connector, pulling pins and checking connectivity. Turns out, we missed a broken pin. He spliced in a good pin cut from an old connector and we were up and running. I cannot begin to tell you how stoked I am that she is alive. 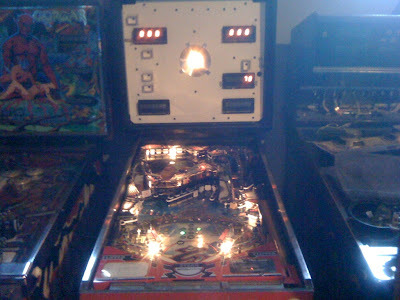 There is still a lot of work to do, like bulbs, cleaning bulb sockets, adjusting some switches, and replacing a broken playfield rail under the playfield. I'm very much looking forward to taking her home and getting some hours in on this machine. So awesome. Big thanks to John Dayhuff for lending me his time and expertise. I'm so damn happy right now, its scary.